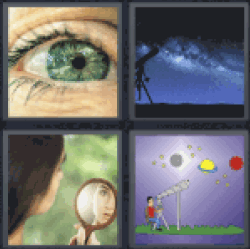 4 pics 1 word telescope. Eye. Telescope and starry sky. Girl looking with a magnifying glass. Child’s drawing with telescope watching the planets. Thanks for visiting 4-Pics-1-Word.com, here are the cheats for your favorite game. 4 pics 1 word telescope. Eye. Telescope and starry sky. Girl looking with a magnifying glass. Child’s drawing with telescope watching the planets.